You know being a nurse goes hand in hand with stress. Like smoke and fire. Or, a hammer and a nail. Your day is often stressful moment after stressful moment – and that can take a toll. 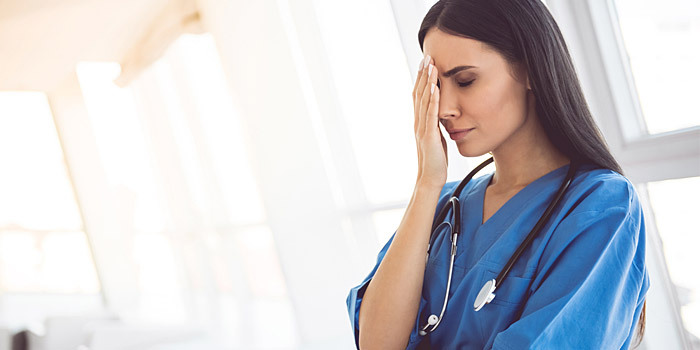 According to a survey by the American Nurses Association, three out of four nurses said stress and overwork were their top health concern. So, while you might be cool under pressure with patients and co-workers, dealing with the stress of being a nurse can have a lasting impact. The next time stress builds up on your shift, try these tips to say good-bye stress, hello calm. As a healthcare worker, washing the germs off when you get home is (hopefully) already part of your routine. Now you can also use that moment as a time to de-stress. Psychologists at the University of Michigan conducted a study which found that washing your hands with soap and water can help turn off self-doubt and the troubling habit of replaying scenarios in your mind once you leave work. So, next time you’re at the sink after a long day, try reflecting on the physical act of washing as a powerful metaphor for "cleaning the slate." Do bad moments at work stick with you long after they’ve happened? It could be something simple like a difficult co-worker or serious like the declining health of a patient whose turnaround is out of your hands. Something as easy as writing down what’s on your mind can help. Researchers at The Ohio State University found that when people wrote negative thoughts down on paper then threw the paper away, it helped to mentally discard the thoughts as well. On the other hand, if you write down and hold onto positive thoughts, in a gratitude journal for example, this can provide peace of mind. You’ve probably heard the adage, “A day without laughter is a day wasted.” That’s because laughter releases pain-relieving endorphins into the brain, according to some researchers and is thought to have many health benefits, specifically attributed to circulation, lungs and muscles. Working in a clinical setting, it’s especially important to keep in mind the medicinal benefits that laughter can provide people who are dealing with chronic pain and physical disability. If you need a pick-me-up after work, watch a funny movie, listen to a snarky podcast or call a friend who makes you laugh! Sometimes nature therapy is the best way to disconnect and recharge. It allows you to take a break from staring at screens and slow down to appreciate the beauty around you. It can also make you more attentive and happier, according to a study from social scientists at Stanford University. If you’re a parent or caregiver, and your day doesn’t end when you get home, get those people involved! Take a walk around the neighborhood, join a community garden or go to the park with your kids and put your feet in the grass. Whatever you do, try to leave your phone behind and be present in the moment – research has shown that practicing mindfulness can change your brain and possibly impact your health. You could also try mixing up your daily routine by taking a different route home from work or when you’re driving around doing errands. Pretending you’re a tourist in your own town or city is a small way to add new scenery and de-stress!